Let's Talk About the Fender Blues Junior: Why it does not sound like a vintage Fender Amp! In the course of selling and building amps I often get asked how my amps will compare to Fender Blues Junior. It is fair question these days. The Blues Junior has become such a common commodity that holds a place as a moderately priced amp that everyone has tried. A Junior sounds okay but if I could not build amps that sound better than a Blues Junior I would be doing something else. The Blues Junior is a good choice for someone trying to get their first tube amp but it not a professional's amp by any stretch. So why is that? What about the Blues Junior is so different from the vintage 50's and 60's Fender designs that are so coveted and that so many of my amps are inspired by? In this article I will delve into the differences in construction and circuit design and how they compare to vintage Fenders. A common misconception about the Blues Junior is that the Blues Junior basically a Tweed type amp. While it is dressed that way it is nothing like a Tweed. The Blues Junior is it's own design--it's own thing. Particle Board or MDF Cabinet rather than solid Pine: absorbs sound and is much heavier (one special edition uses plywood and sometimes the baffle is plywood). Pine is resonate and adds to the tone. Particle board at best is neutral in this regard. 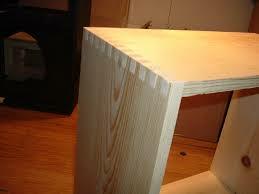 Finger Joints are much stronger than the Dado joints found in the Blue Junior. The downside is that finger joints are laborious adding to the cost. 1" Thick Particle Board Baffle on some models does not allow for vibration like those found in other "floating baffle" designs. Tweed Fenders used 3/8 plywood for the baffle. This width makes the baffle act as an extension of the speaker adding to the coloration to the sound. The downside is that the speaker is less efficient in a "floating baffle design". Whether you like the "floating baffle" or fixed baffle sound is really a matter of taste. One thing to note is that there are some Blues Jrs with thinner baffles but the thicker baffle is more common. PCB Board rather than hand wired: keeps the labor cost low, makes the amp hard to repair and the PCB board causes layout difficulties and tonal loss due to stray capacitance since all components are on one physical plain. The layout is not as ideal since components must be mounted to suit the PCB rather than the best layout for the circuit. Components are smaller and of lower quality in some cases (some parts are just fine). The filter caps are poor quality causing problems with the amp turned up. Illinois Capacitors (the big grey ones) are know throughout the boutique amp world as being the worst brand of caps out there. Inexplicably Fender uses them in almost all their amps. Many other foreign brands sound and work better. Vintage Deluxe Reverb. The tank is in the bag but you get the idea! Small Power Transformer= The Blues Junior uses a power transformer that is very light for the circuit. Since the bias is non-adjustable Fender keeps the transformer running cool enough but it does not have current draw capability for solid power regulation. Turned up the power supply is sagging due to the power transformer! Small output transformer= less low end and less harmonic content and less headroom. Sometime I will be shooting for less headroom so I might pick a smaller transformer in an amp design but I think the Blues Jr. benefits from a larger transformer. 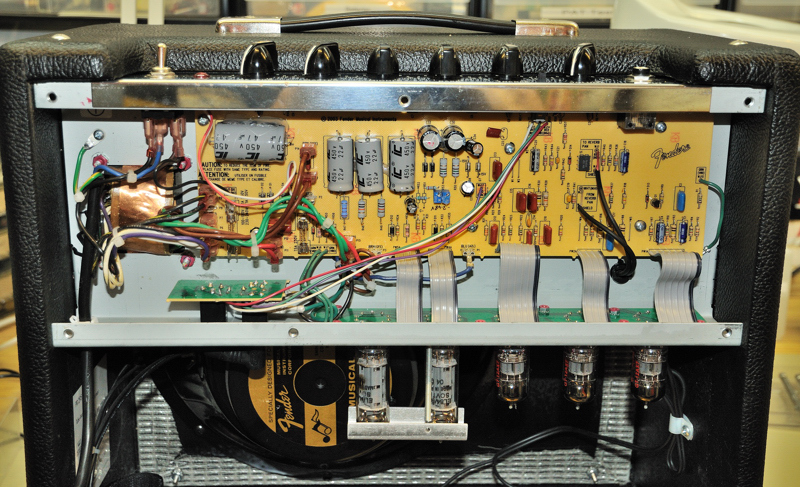 There are many differences in circuit design from vintage Fenders. El-84 Power Tubes rather than 6L6 or 6V6 tubes. El-84s are great tubes but sound little like the 6V6 or 6L6 found in most vintage Fenders. They have less bottom end and more chime. They also tend to be a bit crunchier when pushed. To most ears EL-84s are hard and harsher sounding tubes. The El-84s run at much lower voltages than traditional Fender output tubes making the power transformer cheaper to produce. In addition the voltages are lower throughout the amp in comparison with a 60's Fender amp. Solid State Rectifier: with the exception of the Twin Reverb and a few Brownface designs vintage Fender amps used tube rectifiers which gave them a softer bottom end and singing quality to the sustain. The Blues Junior has a solid state rectifier which is generally brighter with a tighter bottom end. Again it is cheaper to produce a power transformer for solid-state rectification and not have the cost of a tube. The designer could have added sag into the circuit without the tube rectifier but did not in this case. Some players prefer one type of rectifier to the other. Solid State Reverb: Vintage Fenders with reverb used tube reverbs. The Blues Junior's reverb is solid state and does not sound as lush or warm like a tube reverb or even as nice as a high quality digital reverb. Again an amp with solid state reverb is much cheaper to produce. For many players reverb is not critical but difference in sound quality is very noticeable. Master Volume. It you want to kill the tone of a low gain amp all you need is a master volume. The master volume appeals to buyers but not to the ears. The design in a Blues Junior is particularly lossy and a different design would have sounded better. Vintage Fender amps did not have master volume controls and were more dynamic, touch sensitive, and open sounding as a result. The downside is that you have to turn the amps up to get breakup. The Blues Junior uses smaller value coupling caps than vintage Fenders throughout out the amp. The higher a cap's value the more low end and mids pass through the caps. The Blues Junior's lower values equal less bass and mids. It allows the amp to get along better with more pickups but leads to a thin sounding amp. Position of the tone controls in the circuit as different than typical of a Blackface or Tweed Fender. They also use lower cap values--- again passing less bass and mids. It's not necessarily a bad thing but does sound different. The bias is non-adjustable. This prevents the amp from sounding it's best because the output tubes cannot be proper biased. Adjustable bias is necessity in a fixed bias tube amp. This is problem in some vintage amps too. So there you have it. There are mods you can do to improve the tone. A Blues Junior makes a nice platform for gutting out and building a new circuit inside which is my preferred method of modification. Of course if you love your Blues Junior more power to you. Let your ears decide. If not contact me and we can work on modding it! If you own a Blues Junior or Pro Junior I rebuild them in Vox AC 15, Supro 1624, Marshall 18 watt styles, Fender Tweed Princeton, Tweed Deluxe and Brownface Princeton, and Blond CPC-20 styles. Contact me for more details! Blue Junior Rebuilt in a Brownface Fender Princeton! Pro Junior Re-wired to be Marshall 18 style. Note: the radial filter caps are Panasonics which have 10,000 hour life span! Blues Junior converted to Vox AC-15 style circuit! Tweed Blues Junior Transformed in a Carl's Custom Amps Octal Princeton!!! New everything inside including an Alinco Weber Speaker. The owner was very pleased!